A shuttle provider denied a permit to use city bus stops and shuttle zones in San Francisco Monday blamed a union campaign, but transit officials say the company’s record of traffic violations is equally to blame. Bauer’s Intelligent Transportation, a firm that provides commuter shuttles for workers at several Silicon Valley technology firms, is the only company so far to be denied a permit under The City’s shuttle regulation program, which took effect April 1, according to San Francisco Municipal Transportation Agency spokesman Paul Rose. 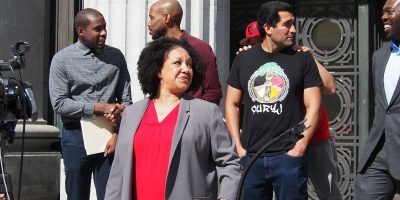 The SFMTA denied the permit in part because the company’s buses committed violations during a pilot commuter shuttle program including driving on weight-restricted streets, using vehicles without identifying placards at Muni stops and stopping in unauthorized locations, Rose said. “While this company’s service comprises about 10 percent of the citywide commuter shuttles, 34 percent of all complaints were about their particular service,” Rose said. In addition, the company failed to file an adequate service disruption plan, which requires it to outline steps it plans to take to avoid potential disruptions due to labor disputes and inform the SFMTA of any labor issues that might disrupt traffic and service. Bauer’s, which was the subject of a failed organizing campaign by the Teamsters union last year, was picketed by union members as recently as March 22, disrupting Muni service and traffic. Bauer said company drivers are paid comparably to “Teamster-represented chauffeurs” and voted “decisively” against representation by the union. Union officials have said the company conducted a “brutal” anti-union campaign leading up to the vote. Supervisor Aaron Peskin, who joined union members in their picket of the company on March 22, also introduced a resolution with the backing of most of the Board of Supervisors that day calling on the SFMTA to deny Bauer’s permit until it can comply with “Labor Harmony” provisions in the shuttle program. The resolution, scheduled for a vote at tomorrow’s board meeting, is now something of a “moot issue” since the SFMTA took action without a board vote, Peskin said Monday. Bauer’s has not yet filed an appeal of the permit denial but has 15 days to do so. The company also has a three-week grace period before it has to stop using Muni stops, so customer service will not immediately be affected, Rose said. The SFMTA has granted permits to 11 transportation companies so far under the shuttle regulation program, and requested further information from another three, Rose said. Bauer’s is so far the only company whose permit has been denied. Transportation companies can legally continue to provide shuttle service in San Francisco without a shuttle program permit but must find legal places to load and unload other than Muni stops and shuttle zones. Bauer’s officials stressed that service will continue uninterrupted while the company works out its permit issues.